The exhibition set developed especially for the launch of the new Mercedes-Benz SLK uses evocative stereoscopic images to bring to life that unique feeling of driving with the top down. Its modular design allows it to be flexibly adapted to suit all kinds of exhibition spaces. 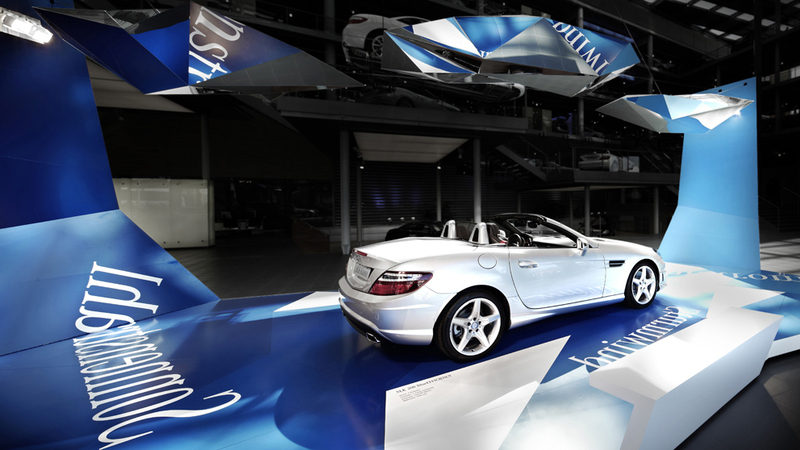 The SLK is the focal point of the installation, which features a blue colour scheme and cloud imagery to evoke the sensation of driving a cabriolet. Polygon-shaped clouds with reflective elements suspended from cables create an illusion of dynamism and a wide-open sky. The temporary exhibition set can be assembled in 8 hours. It is a stand-alone set, i.e. it contains all the necessary suspension equipment and lighting elements.